This is it, my friends. The very last Sourdough Surprise challenge. I am so thankful for every single one of you who had emailed me and left wonderful comments. I have loved getting to know you all and learning about sourdough with you! And we've made a ton of tasty creations together, haven't we? We can't really do a challenge in December without it being holiday themed! Which is awesome for us because there are SO many fantastic holiday foods out there that are just begging for some sourdough loving! For this challenge we will be focusing on all the special holiday breads out there - Stollen, Panettone, Santa Lucia Buns, etc. I know that we typically shy away from "breads" here, but there are so many great holiday themed breads that I couldn't resist! 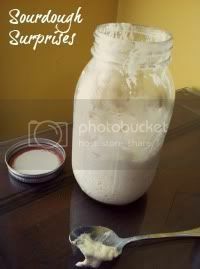 As always, you can use any recipe that you wish, as long as it incorporates sourdough starter. If you would like some recipe ideas or inspiration, please check our our Sourdough Holiday Breads Board on Pinterest! Please come back and link up on December 30! As I mentioned before, this will be our very last challenge, and I would love to see as many people participate as we can! Also, its my birthday... ! Sourdough Surprises - Donuts 2.0! Thank you to everyone who made a Pumpkin flavored sourdough creation! They were amazing, and I can't believe the awesome variations we got! Way to go everyone! Before we get to the November Challenge, I have an announcement to make. I have put off writing this post for a long time, because I don't want to do it. But I think the time has come for us to say Goodbye to Sourdough Surprises. We have had an amazing three and a half years together! We have made some great friendships, learned that our sourdough starters can make practically anything, and have created a wonderful community together!! But unfortunately, sometimes we know that is time to move on to other things. We will have a November challenge (Due Nov 30) and our final challenge in December will be completed Dec 30 - so please participate these last few challenges! And in case you were wondering, all the recipes on this site and our extensive Pinterest boards will remain open, so that we can always serve as a resource for your sourdough baking needs! We will also continue to keep our Facebook page open, so that we can continue building our friendships, and sharing our amazing sourdough creations! Please feel free to post any pictures of things you have baked, questions you might have, or links to blog posts you have written or are inspired by! We won't be hosting challenges anymore, but we definitely still want to stay in touch with you! Thank you so much for all your amazing support, and the great community we have built because of you! Ok, now that we have that out of the way, its time for the November Challenge! Technically we've already visited donuts, but this was one of the first challenges we ever did, and well, I want to do it again! Because, Donuts! Please check out our How To Play post to see what you need to do to participate this month (its super easy). Like always, please feel free to use any recipe that you like - as long as it contains sourdough starter, you are good to go! 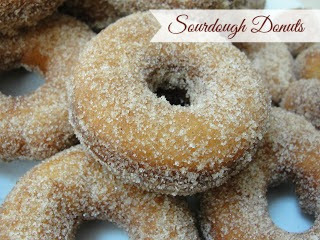 If you would like to see some recipes, or inspiration, please check our our Sourdough Donuts board on Pinterest! Come back Nov 30 to link up your post! Its October here in the United States, which means everything and everyone is completely and utterly obsessed with Pumpkin! It thought it would be fun to see how creative we can be in combining pumpkin and our beloved sourdough starters. This means you can make anything (Yes, anything!). As long as it includes pumpkin and your sourdough starter, it goes!! So what will you make? Something sweet? Something Savory? 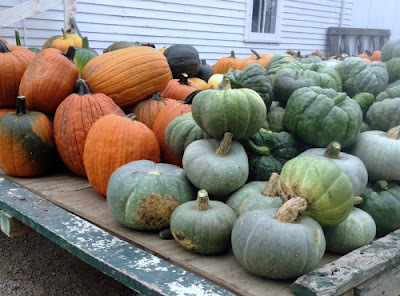 (And because I know someone will ask, yes, you can use a different winter squash if you so choose!) And because I am super late in posting this month's challenge, we will extend the deadline until Oct 30th! Can't wait to see what you come up with!! Please check out our "How to Join" page for information on how to add your page to our link-up! Make sure you come back to THIS post on Oct. 30, 2015 to add your links! ** If you don't have a blog but would like to join us anyway, that's awesome! We would love that! Simply bake along with us, and send us an email containing a picture of your creation, your name, and a brief description of what you made and we will include it on the reveal day post! Sourdough Crumpets, English Muffins, Welsh Cakes & More! I wasn't really sure what to call this challenge, so I went with Griddle Breads, since all the variations can be cooked on a griddle. I know we have made Sourdough English Muffins before, but I feel like there are so many great variations of the same theme that we should explore! Crumpet recipes always include milk, and English Muffins do not! Crumpets are made from a batter, while English Muffin are made from more of a dough. Crumpets are cooked on the one side only, English Muffins are cooked on both sides! Crumpets are generally served whole, with butter and jam served on top, and English Muffins are generally split in half before serving. But that's not all, there are other variations from the region, too! A Pikelet is a regional variation of a crumpet, and these are traditionally cooked without a ring, which means they are a little flatter/thinner than a crumpet. A Scottish Crumpet is essentially a pancake cooked in a slightly different way. These are usually cooked to brown on one side only, resulting in one smooth darker side, and one side filled with holes from bubbles that is cooked only lightly . They are made plain, or with dried fruit baked in, are eaten at room temperature with butter and jam. A Welsh Cake is is a soft and tender cross between a pancake, a biscuit, and a cookie. They are often studded with dried fruit, and can be eaten plain, sprinkled with cinnamon-sugar, or eaten with jam. So, which are you going to go with this month? (And did I forget any variations?) As always, you may use whatever recipe you like, and any flavor you like. Please check out our Sourdough English Muffin, Crumpets, etc. Board on Pinterest for recipe inspiration! Please check out our "How to Join" page for information on how to add your page to our link-up! Make sure you come back to THIS post on Sept. 20, 2015 to add your links! Please Note: These are not flat-breads. If you are interested in making tortillas, naan, pitas, etc, please check out this post. Can't wait to see what you have made! We have a super special treat for you today! Several of you have asked for knowledge about Gluten Free Sourdough Baking. I don't a thing about gluten free, so I asked the amazing Natasa if she would mind preparing some info for you. The following is a guest post written by her, and it is so detailed and interesting! I know you will enjoy it! Natasa Djuric is the real sourdough baking specialist and the author of My Daily Sourdough Bread blog (www.mydailysourdoughbread.com) where she shares her knowledge on how to bake delicious and great-looking sourdough breads and other sourdough goods at home. She is also the author of the online step-by-step sourdough baking master class Instantly Experience the Power of Real Sourdough Baking (www.learnsourdoughbread.com) which includes more than 25 diverse both gluten and gluten-free sourdough recipes and enhances your baking skills and health to another level. Taste for sourdough is growing worldwide and that is easy to understand. Crusty loaf, made in honoured way using and harnessing the raising power of wild yeasts and bacteria. Real sourdough baking is an object of craft, beauty and nourishing. Its characteristics and flavour is vastly superior. It's no surprise that more and more people are learning this ancient skill. Just like sourdough baking, gluten-free baking in general has gained a lot of attention in the last years. Many people suffer from hidden gluten sensitivities and to uncover this for yourself you need to go gluten-free for at least few weeks and monitor your body and well-being. Bread is a major part of the modern diet. It’s a staple in our everyday lives and many people are eating some type of bread with most of their meals. Going gluten-free and eating no bread can be nightmare for some people, because there are no decent alternatives to gluten breads and gluten-free baking is quite a challenge. Let's explore this further. Thanks for all the brave participants who made sourdough wontons! You guys rocked not having a recipe provided, and it was so fun to see all the varied and delicious recipes you came up with! Pat yourselves on the back, because you did great! For the month of August we will be making Sourdough Coffee Cake! If you are unsure of what coffee cake might be, it is a moist and tender cake topped with some kind of streusel. Its called coffee cake, not because it has coffee in it, but because you typically serve this cake for breakfast or brunch alongside coffee or tea. Some have a swirl of streusel inside, others are filled with fruit preserves or buts, or even chocolate. Coffee cakes are typically not frosted - they come out of the oven ready to eat, although you can also drizzle a little icing on top if you like! This is a very American kind of cake, it is easy to prepare and tastes great! As always, you may use whatever recipe you like, and any flavor you like. Please check out our Sourdough Coffee Cake Recipe Board on Pinterest for recipe inspiration! Please check out our "How to Join" page for information on how to add your page to our link-up! So, for this month, I have a challenge for you! I posted on Facebook and asked if you wanted to make something sweet, something savory, or something challenging and without a recipe. Since only two of you answered (Thanks Kelly & Russell), and both of you picked the challenging one, that's what we are going to do! And I am so excited about it! I have been wanting to do this for a while now, but I haven't been able to find a recipe for it, and I haven't had the time to create one for you, either. SO, part of this challenge is creating your own recipe! Are you ready to find out what we are making? Like i said before, I wasn't able to find an actual recipe for sourdough womtons, so i want you to put on your thinking caps and eee what you can come up with! Check out the Steamy Kitchen site for a great tutorial on how tommake wontons (fried and boiled and even dessert!). And if you need some inspiration, check out the Monthly Inspiration Board on Pinterest! Not only can you use whichever recipe you like, but please feel free to use whatever flavorings and additional ingredients you want! There are no rules, except stick to the topic and include your sourdough! Have fun, and we can't wait to see what you make! To Join us for July, please read our "How to Join" Page. It's time to show off your creation, so link up below! Share the love on Facebook, twitter and instagram by tagging your photos #sourdoughsurprises so everyone can see!